Brakes are one of the most important safety systems on any vehicle, therefore it is essential you monitor them closely. Fixing issues that crop up may seem prohibitively expensive, but that pales in comparison to the cost of leaving brake problems unchecked. Read on for Park Muffler’s top five signs your brakes need replacement or repair. If your brakes whine or screech when you apply the pedal, it is easy to assume something is very wrong. In reality, brake manufacturers build a small metal plate into the pads. This is embedded at a level where the sound it creates means it’s time to have your brake pads replaced. 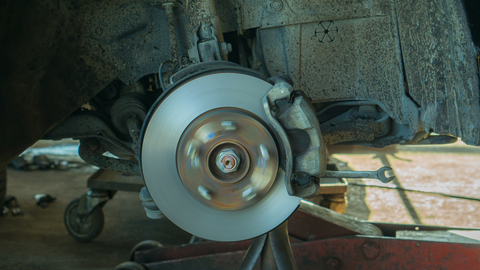 To ensure your brakes don’t get worse, have them inspected as soon as squealing starts. Brake pads are essential as they prevent the metal caliper from coming into direct contact with the metal disc or rotor. This type of metallic wear is extremely damaging to brake components and is indicated by a deep grinding or growling sound. Any evidence of these should be dealt with immediately. Another common sign of worn brakes is a sensation that your vehicle is lurching to one side or another as you slow down. Generally, this means one or more of your brake pads is wearing unevenly– as they grip, the side with more stopping ability pulls back on your vehicle more than the other. Not only is this unsafe, but it can spread the uneven wear to your discs and tires as well. Always make note of any vibrating or jittering when you are slowing and stopping your vehicle normally. These issues indicate that your disc rotors may be warped– if left too long it can be almost unfixable, but they can be resurfaced if caught early enough. Always take precautions when traveling down steep roads or towing heavy loads. As the driver’s key point of contact with the brake system, the brake pedal can tip you off to issues before they get worse. A soft or mushy pedal can indicate worn pads or a leaky hydraulic system. A touchy or hard pedal could mean moisture or obstruction in the brake lines, damaged rotors or contaminated brake fluid. Regardless, any difficulty operating the brake pedal should be addressed as soon as possible. The above warning signs are only some of the possible ways your vehicle is telling you that your brakes need inspection. Questions? Concerns? Contact or visit Park Muffler today!